I love grammar and English and literature and reading – and even phonics! It’s crazy I know! But I’m excited that we’ve found a grammar program that I enjoy and that is relatively painless for Curly. Ohh-and she retains the information really well! And it’s even easy to use! It might be love! 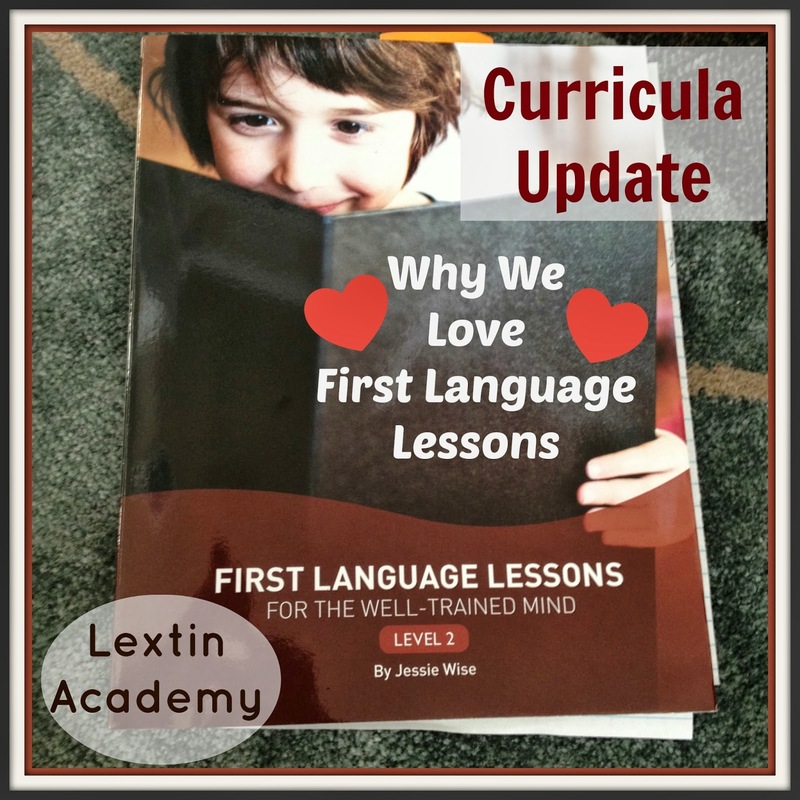 We finished our phonics curriculum early last year and decided to move into a few different thing then continue on with the next level of that program. I was afraid Curly wasn’t quite ready for the larger amount of work and the big jump in difficulty in the next level. So, I decided to try some new things for review and extra practice. I added in some extra spelling and then decided to try a new grammar program (and a writing program too)…. I bought First Language Lessons Level 1 and we both enjoyed the short lessons and the slow pace of the program. It was quick and pain free for both of us. (However, it was a little bit of overkill on the many lessons about nouns – I mean, we get it already!!) Other than that, it was a great intro to grammar. Well, this year I knew we had to continue with the program! And we like Level 2 even better! We began by reviewing the memory work poem from lesson 2. Then we recited the definition of a preposition together multiple times. Next we chanted the first part of the list of prepositions that we had already learned before adding 4 new prepositions to the list. We looked back at a picture study from a previous lesson and found things that were beside, between, beyond, and by (after explaining what each preposition meant). We looked back at a poem in another previous lesson and found another use of the word “by” and discussed what it meant. Then we reviewed our list of prepositions with the 4 new words. Next I dictated some sentences to her. I then had her find the preposition in the sentences. At the end of the lesson I read the first stanza of a poem by Wordsworth. She copied the lines of poetry and drew a picture to illustrate the poem after we first found the prepositions in that poem. I love the random picture studies scattered throughout the curriculum. They are so a fun and refreshing break from grammar! We really enjoy the poems to memorize. Some of them are used in lessons and we do grammar exercises using the poems. The whole program feels so organic and just sit-on-the-couch-and-snuggle while doing grammar. What more could you ask for? There is great review in the program and Curly has her parts of speech down cold. The concepts are introduced slowly, then reviewed, then built upon. It’s never overwhelming and we never forget what we’ve previously learned! The program includes copywork, dictation, and other concepts such as how to address a letter and write a postcard. I appreciate the built in memory work of the definitions of the parts of speech as well as the lists of state of being verbs, helping verbs, articles, conjunctions, and prepositions. The lessons are short and are completed in more of a discussion format than completing worksheet pages. There is also relatively little writing in the first two levels (but I know that amount of writing picks up in later levels). This is great for younger kids who aren’t ready for as much writing yet. We are excited to move on to Level 3 next year! We're also using Level 2 this year and will move on the Level 3 next year. I had just learned of this curriculum when Natalie was at the tail-end of the age bracket, and I so wish I'd known about it sooner so she'd have gotten a better grammar foundation (as she's now pretty much in the logic stage). I really love it! It's been so easy to use and Curly has picked up the grammar rules effortlessly. It's been so simple and at times even fun! I can't wait to use the next levels.